Describe the main temples on the Altis. Which in your opinion is the most impressive and why? The Atlis is the home to the two largest temples at Olympia, the Heraion and the temple of Zeus, Also home to the Philippeion. Sophie McKenzie-Howard 29/09/2011 Describe the main features of the temples on the Altis. Which in your opinion is the most impressive and why? The sanctuary at Olympia is located in the west end of the Peloponnese, 18kn inland from the Ionian Sea, just south of the foot of the hill Kronos. The two rivers, Alpheios and Kladeos, border the site which increases the planes fertility. This grove was planted with plane trees, wild olives, poplars, oaks and pines. The central sacred area or the temenos of Olympia known as the Altis contained the main religious buildings, the temples and votive offerings. The Atlis is the home to the two largest temples at Olympia, the Heraion and the temple of Zeus, Also home to the Philippeion. The temple of Hera, the Heraion, is impressive because it was the first temple on the Altis therefore being the oldest out of the two, c. 600-580 B.C. You can tell this is an early temple because the columns are very close together causing the temple to appear squat and sturdy. This gives evidence of the Greeks not understanding the existence of load bearing until after the temple was built. ...read more. At the western end of the naos was a platform. This is where Hera's cult statue was, but as the society built it became increasing more male dominated resulting in a cult statue of Zeus being put alongside her. The cult statues in the Heraion were early archaic, or as Pausanias puts it: 'simple-minded'. Then society becomes even more patriarchal leading to the building of 'The Temple of Zeus'. The gigantic temple of Zeus, a Doric peripteral temple from the early classical period (c. 470-457 B.C) was erected in the southern part of the Altis to commemorate the Elean defeat of the Pisatans in 470 B.C. The temple itself (27.68 x 64.12 m; 6 x 13 columns) was the work of the Elian architect Libon. I think the temple of Zeus is particularly impressive in comparison to the Heraion and the Philippeion which it dwarfs. For example, the dimesion of the temples stylobate was huge compared to a mere 15.3 m base which the Philippeion stands on. The heights of the external columns are 10.84m with their diameters at a staggering 2.25 m. The dimensions are so because Libon wanted to represent Zeus' power. ...read more. This is because it was built sometime after 338 B.C by Philip of Macedon to mark his final victory over the Greeks at the battle of Chaeronea. It is found just behind the Heraion on the Altis, almost against the boundary. The Philipeion was a tholos of stone and marble in the Ionic order. The 18 Outer columns were Ionic and supported a plain frieze topped by dentils. The roof was made of poros marble, like the rest of the temple. The naos had 9 marble Corinthian half columns and a marble base to the cella wall: above was limestone, stuccoed and painted to imitate brick work. The naos was lit by two windows either side. The floor was ornately decorated with rhomboid flag stones. These black and white stones were arranged regulary at degree divisions of a circle. I think this is very impressive as there isn't another on the Altis like this. Its decoration and geometric shapes much have been extremely complexed to design which I admire. To conclude, I think each building, the Heraion, the temple of Zeus and the Philippeion are impressive for their own individual aspects. However my personal favourite in the Philippeion, simply for it's impressively bold and intriguing floor designs and daring mixture of Ionic and Corinthian order. Unlike the other two temples which only base themselves on the classic Doric order. ...read more. 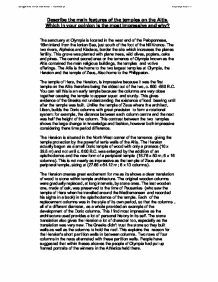 This student written piece of work is one of many that can be found in our AS and A Level Classics section. Pisa, this is an example of the ongoing struggle for power in Ancient Greece. The architect was a local man named Libon who designed the structure in the pure Doric style. The temple stood on a 3 step stylobate with a masonry ramp leading upto the centre of the east fa�ade. The solute, ethanoic acid has no dissociation or association in both solvents. This assumption is invalid as ethanoic acid dissolved in water ionizes to some extent in water and it also dimerizes to some extent in butan-1-ol. Alcibiades even used his Olympic victories to support an argument in the Athenian assembly. The religious root shows itself in the seriousness with which the Games took place. Our word agony, which is derived from the Greek word for competition - ??? ?, gives an idea of the spirit in which the Ancient Games were contested. Three hundred Spartans including King Leonidas died in honour at Thermopylae. Though the Greeks had been defeated again their confidence grew as the three hundred Spartans proved the Persian army, although mighty in numbers were weak in their form. The Greeks had their freedom to fight for and now they had faith that the mighty King Xerxes could be defeated. Traditionally the more treasure a king has in his tomb the greater he is, so in this way treasure is symbolic of greatness, the more treasure the greater the king. The Sea- The sea was symbolic of a dwelling for evil. In your opinion, where did the real power lie within the Spartan Constitution? An example of such resentment, and coercion, would be the annual declaration of war on the Helots; a coercive form of manipulation which serves to terrify the Helots into compliance but, as it continues, the feelings of resentment and resistance build until rebellions occur. A successful example of this is the, 'Capture of Cerberus'. This metope (the 11th labour) shows Herakles dragging the Cerberus into daylight - the labour is over. It would have been hard to depict a three headed dog guarding the gates of Hades on a metope, making sure it was clear enough to identify. Looking for expert help with your Classics work? What picture do the sources present of life for women in ancient Athens?